Sharif FarsiWeb, Inc. (شرکت فارسی‌وب شریف، سهامی خاص) is a company established in 2003, based on the then FarsiWeb Project Group of Computing Center, Sharif University of Technology. FarsiWeb’s main activities include distributing and supporting Sharif Linux, providing consultation on technical and legal issues of free and open source software, and standardizing issues related to the Persian language in information technology. Sharif FarsiWeb has been established with help from Cyber7, Sharif University of Technology, and Science and Arts Foundation. FarsiWeb team members. FarsiWeb is currently a de facto leader of the issues concerning Persian script and computing in several international communities. It is an active member of all the three international organizations that work on internationalization standards: the Unicode Consortium, the World Wide Web Consortium, and the International Organization for Standardization (ISO) and officially represents Iranian High Council of Informatics (HCI) in the above organizations. It has also been active in The Internet Engineering Task Force (IETF) and has become one of the most credited references regarding IT issues not only with the Persian language and script, but also with Arabic, Urdu, Pashto, and Azerbaijani languages which share the script with the Persian language. FarsiWeb has successfully pursued its Persian language-related interests through communicating with companies such as IBM, Microsoft, Netscape, Oracle, Red Hat, Novell, Mandriva, Evertype, and Sun Microsystems, and has helped them improve their Persian language and Arabic script support in their products. This cooperation has been so fruitful that much of today’s Persian support in the internationalized applications used daily in Iran is a direct or indirect result of FarsiWeb’s contributions. FarsiWeb aims to assist independent software projects, minimize software development costs, and eliminate Persian applications’ dependence on proprietary products. Therefore it is involved in free and open source software projects, has contributed code to many of them, and has been active in their quality control processes. These projects include the Gnome project, the OpenOffice.org project, the Fedora project, Wikipedia and Mediawiki projects, Firefox and Mozilla projects, Farsi TeX project, GNU C library, FriBiDi project, and a lot more. The company has itself developed toolkits, libraries, and applications to facilitate Persian information exchange and add Afghan and Iranian local support to GNU/Linux and Windows, and has distributed all of these products under free licenses (mostly under the GNU General Public License). The FarsiWeb lab was in Sharif University until August 2005, but has since moved out of the campus. 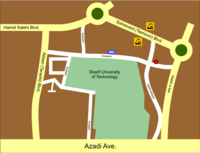 The lab is still in walking distance from Sharif campus. For directions, you can use the map at the right side of this page.